Or, as I believe H.L. Mencken said: “…the rich are different from you and me-they have more money…” (or perhaps these days, given the now-fungible definition of ‘money’, more credit access at better rates…). Thank you, as always Wolf, for your tireless efforts in providing the numbers of the various trucks that continue to plow into us average folks. May we all have a better day. The Truck is just over the top of the hill! And the hill rises through the clouds. Not Mencken. It was Hemmingway. The Fed is to blame. The plan is to cause an economic collapse now so that Trump can run for reelection in a rising economy that he will be able to take credit for. If that was their plan they’re too late because there’s no way this is going to be a little blip recession. You’ll get your Democrat in 2020, don’t you worry. I hope we get another FDR. Seriously, what President or Congress since FDR has been the opposite of FDR? They all look similar to me. Spend, spend, spend, drop bombs, a chicken in every pot, spend, spend, spend, drop bombs, a chicken in every pot…. Won’t the rising economy be based on – just more borrowed monies at a higher rate? More castles in the sand? OTOH, retailers typically file BK in Q1 and if this is primarily retail driven, then we should be seeing a spike now. BK’s also lag the economic stress in the business and retailers have been under severe stress for 2+ years now. Not saying there isn’t a wider issue, as increasing rates may be taking their toll on zombie companies, but seems like an industry breakdown would be in order. But the numbers and charts are comparisons to the same period last year, and to the same period in prior years, precisely to eliminate the effects of seasonality, as I pointed out in the article. Sunglasses do not protect zombies. For the later to survive they need those clothing retail companies, but oops those have gone bankrupt as well. If only the oldest zombie of them all i.e. Warren Buffet can be exposed. But nah America will bend over backward to help him as much as possible. Translated: The books are cooked – don’t look. Raising rates sure seems to start the melt down. Will they back off before it gets bad? Probably not. Another Monday, another Dow head- fake. Down 500 + on Friday so there MUST be huge uptick on Monday. Sure enough there was, for a while. Then it evaporated in the afternoon. This pattern is becoming so obvious you have to wonder if the same people juicing the early market are the same ones selling before the close. If so, who is the meat in the sandwich? My guess: the ‘buy the dip’ guys. 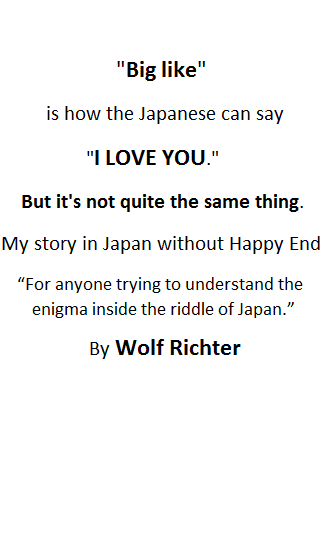 I noticed this for the last month or 2. It is so obvious that I am starting to wonder if it is a computer generated algo the sells to end the week and promptly buys at opening on Monday. The first guy to sell on Fri (or Thursday because of Good Friday) seems to win and cause the drop for the day. The market then opens for a new week and goes on a 3 hour buy streak until noon Monday depending on how big the drop was the business day before. Looks like the zombie unicorns are falling from the sky, no more cheap debt to keep flying. The infamous “0% Interest rates” from years ago have birth to a lot of “Keep going thanks to taking debt” companies like Uber. Also it made leveraged buy outs quite easy, and made companies in trouble willing to take cheap debt to keep going. All if that has been crashing down for a while, at least since 2017. Those who got out of enough debt before it started to get too expensive are gonna last for a while more. Those who didn’t are gonna crash and burn. Don’t you love the smell of burning zombies? FED: I told you man, I told you I was gonna raise the rates. Zombie Company: ARRHH! FIRE BAD, FIRE BAD! Of course that’s the not only reason, some companies just don’t work out, or have failed products, or are outright scams. Remember Juicero? Banks should be banned from even touching subprime loans. Leveraged Buyouts should be illegal. People should be smart enough to not invest in companies that are in so much red it looks like they are at the botton of the red sea. But then again, we never truly learn, do we? Many restaurants closing by me. And I live in a big city. Good Who needs dem stinkin restaurants anyway? That has been coming since years ago. Big cities like New York have way more restaurants that they need and many are barely scrapping by or operating at a loss. The fact that as soon as people started to go out to eat less a lot of them were gonna die is well know. Every time economy booms going out to eat becomes popular and big cities get filled to the brink with restaurants. But then comes a crash, people eat out a lot less and many restaurants disappear. Really, because people who eat out a lot don’t cook – at all. So what are they eating – a Big Mac with fries & coke is just as pricey as a meal in a inexpensive restaurant. They have scaled down to cheap eats & a soup kitchens once a week. Restaurants need to be flexible if they want to survive, as the economy slides into the pit of despair, they need to be more creative to keep the customer fed. Indeed. McD’s is as expensive as Denny’s or IHOP. The really poor people have scaled down to soup kitchens indeed. When I was in my 20s, McDonald’s was an almost non-existent luxury, the same when I was growing up. I’d go to the market and get a baked chicken leg/thigh section, or a package of lunch meat, really cheap but high nutritional value things. No prepared salads, I’d get a cucumber or some tomatoes. I’d get different grains and things, rolled oats, slivered almonds, etc and make my own “granola” that I could pour milk over and eat for breakfast. Much of the time my breakfast was just a couple of glasses of milk with just enough Nestle Quik in it to make it a little sweet. The real “McDonald’s” of the poor are the taco trucks. You can get really good tacos for a dollar or so each. 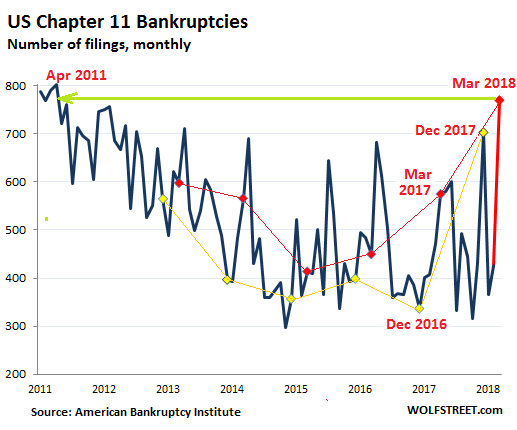 Can you please provide a direct link to the first chart regarding US Chapter 11 bankruptcies in the American Bankruptcy Institute’s website? The charts are mine based on the raw data I received from ABI. You can get this data by going to the linked ABI site, hover over the tab “Newsroom” and click on “Statistics.” There you can download the data in spreadsheet format. I looked at other charts in ABI’s website and then I realized your chart here is for Commercial chapter 11 filings only. 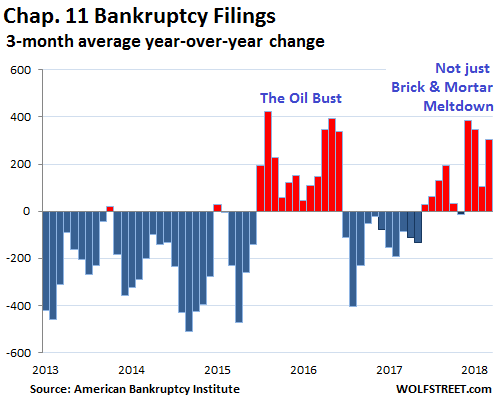 The chart for Total Bankruptcies is different, we don’t see an increase like Commercial. So my question would be how to correctly analyze this? 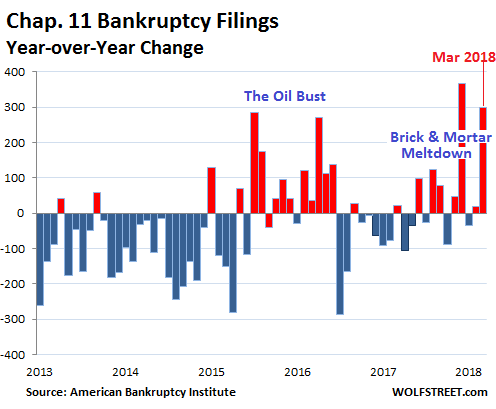 What importance do other bankruptcy chapters and consumer bankruptcies have when we want to analyze the whole market? 1. The fundamental problem currently is that our productive capacity (worldwide) has seriously outstripped demand (and is likely to get increasingly worse, thanks to automation), à la the 1930’s. That has combined with an income distribution which (as in the 1920’s) increasingly favors the rich– reducing the overall consumptive capacity. Brace for a depression worse than the 1930’s. What do we do with all that production when only the 0.1% can afford it? 2. This time, the game was kept going beyond all reason by all sources (especially governments) providing ‘unlimited’ amounts of cheap (credit) money to all and sundry. But that has a limit– at some point the non-governmental lenders become more cautious than greedy– and the ball starts rolling downhill. Unfortunately, unlike “real” money, “credit” has a time limit!